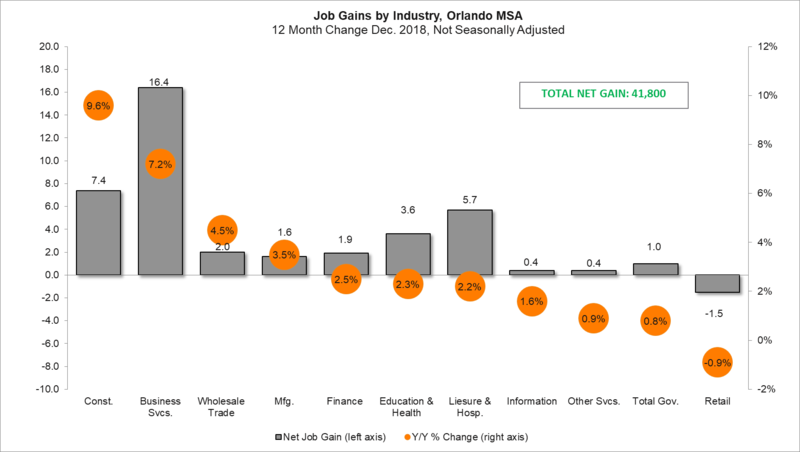 Reports show the Orlando MSA added 41,800 jobs from December 2017 to December 2018, achieving a growth rate of 3.3 percent. Compared to similar high-growth metros with more than 1 million jobs, including Phoenix, Houston, Austin and Las Vegas, Orlando tops out as the fastest growing metro in the nation, continuing a trend that began in 2015. Florida’s over-the-year job growth rate has exceeded the nation’s rate since May 2012. The State of Florida gained a total of 213,600 jobs, an increase of 2.5 percent during the same time period. Nationally, the number of jobs rose 2.0 percent over the year. Contrary to conventional wisdom, employment growth in the past year did not solely stem from the Orlando region’s world-class tourism sector; in fact, the strongest growth occurred outside of leisure and hospitality. Professional and Business Services accounted for combined 39 percent growth, adding 16,400 jobs of the total added from December 2017-18. Construction followed close behind with 18 percent of the total growth, adding 7,400 jobs, and Leisure and Hospitality contributed 14 percent, or 5,700 jobs, of year over year job creation. Regarding Florida as a whole, one of the industry categories adding the most jobs was education and health services (+40,100 jobs, +3.1 percent). This data parallels a similar finding detailed in the 2030 report, with research conducted by the Foundation for Orlando’s Future, in which healthcare is predicted to be the fastest growing industry in the coming decade. The Orlando region ranks six among Forbes’ 15 Best Big Cities for Jobs. Forbes cited Orlando’s science, technology, engineering and mathematics (STEM) job growth in recent years as one contributing factor, explaining “Orlando (is) actually now adding STEM jobs at a faster clip than the Bay Area metros." In a separate study, Forbes calculated Orlando’s rate of STEM job growth as the highest in the country. Additionally, Emsi ranked Orlando third-highest among large MSAs for STEM job growth over the last five years. And, in its “2018 Leading Metro Locations” report, Area Development ranked Orlando 11th out of 394 MSAs for prime workforce. Orlando doesn’t just lead the nation in job growth; it is also top ranked for population growth. From 2016 to 2017, the four-county region that makes up the Orlando MSA – Lake, Orange, Osceola and Seminole County – grew by 2.3 percent to reach a population of just over 2.5 million people. That growth rate is more than double the national growth rate and the highest of all 30 of the largest cities in America. For comparison, two of the other fast growing U.S. cities, Atlanta and Denver, grew at 1.5 percent and 1.3 percent respectively. Coming in at No. 2 and 3 was Las Vegas at 2.2 percent and Dallas at 2.0 percent. Orlando is the No. 1 large metro in the country for the growth of the working age population (ages 18-64). It is clear the Orlando region is booming in terms of both population and jobs. Those who think Orlando is the “happiest place on Earth” simply because of its attractions do not know the half of it. Note: Employment estimates have been rounded to the nearest hundred. Sum of detail may not equal totals due to rounding or the exclusion of certain industries from publication. 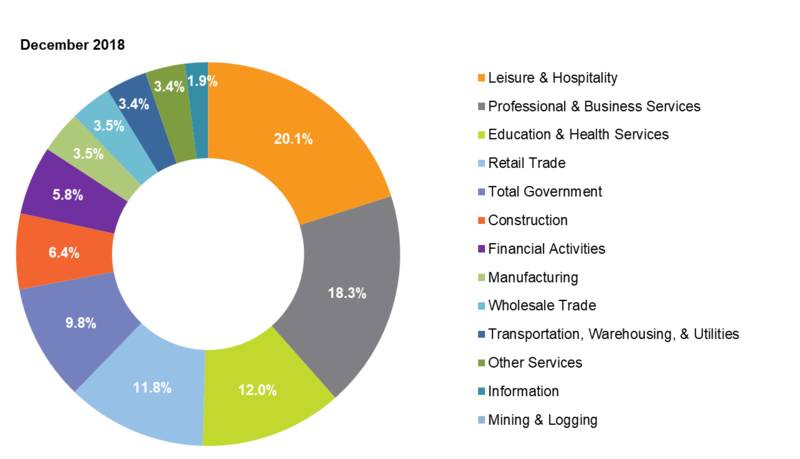 All data are subject to revision due to late reporting of participants and the annual benchmarking process.